The Phalcon\Mvc\View and Phalcon\Mvc\View\Simple are responsible for the managing the view layer of your MVC application. The setVar allows us to create view variables on demand so that they can be used in the view template. The example above demonstrates how to pass the $postId parameter to the respective view template. Action View app/views/posts/show.phtml This is the view related to the action. It only will be shown when the “show” action was executed. As seen above, Phalcon\Mvc\View supports a view hierarchy. You might need to control the level of rendering produced by the view component. The method PhalconMvc\View::setRenderLevel() offers this functionality. Although you may perform model manipulation operations such as insert() or update() in the view layer, it is not recommended since it is not possible to forward the execution flow to another controller in the case of an error or an exception. //Cache this view for 1 day with the key "resume-cache"
When we do not define a key to the cache, the component automatically creates one doing a md5 to view name is currently rendered. It is a good practice to define a key for each action so you can easily identify the cache associated with each view. When using view caching is also useful to prevent that controllers perform the processes that produce the data to be displayed in the views. //Enable the cache with the same key "downloads"
Template Engines helps designers to create views without use a complicated syntax. Phalcon includes a powerful and fast templating engine called Volt. 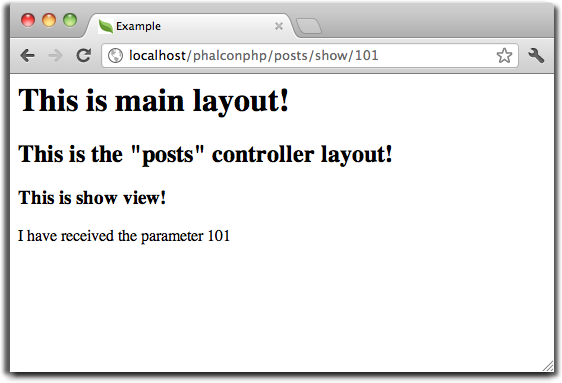 Additionally, Phalcon\Mvc\View allows you to use other template engines instead of plain PHP or Volt. Using a different template engine, usually requires complex text parsing using external PHP libraries in order to generate the final output for the user. This usually increases the number of resources that your application are using. url: "<?php echo $this->url->get("cities/get") ?>"
//Attach a listener for type "view"